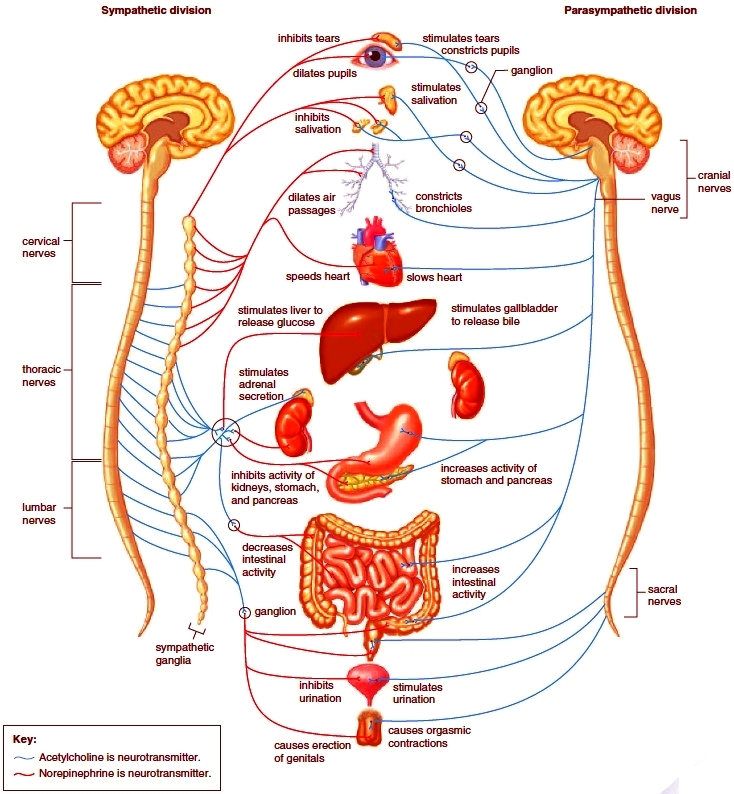 The autonomic nervous system (ANS) is composed of the sympathetic and parasympathetic divisions (Fig. 8.14). These two divisions have several features in common: (1) They function automatically and usually in an involuntary manner; (2) they innervate all internal organs; and (3) they utilize two motor neurons and one ganglion for each impulse. The first neuron has a cell body within the CNS and a preganglionic fiber. The second neuron has a cell body within the ganglion and a postganglionic fiber. Visceral reflex actions, such as those that regulate blood pressure and breathing rate, are especially important to maintenance of homeostasis. These reflexes begin when the sensory neurons in contact with internal organs send messages via spinal nerves to the CNS. They are completed when motor neurons within the autonomic system stimulate smooth muscle, cardiac muscle, or a gland. These structures are also effectors. The sympathetic division is especially important during emergency situations when a person might be required to fight or take flight. It accelerates the heartbeat and dilates the bronchi-active muscles, after all, require a ready supply of glucose and oxygen. On the other hand, the sympathetic division inhibits the digestive tract-digestion is not an immediate necessity if you are under attack. The neurotransmitter released by the postganglionic axon is primarily norepinephrine (NE). The structure of NE is like that of epinephrine (adrenaline), an adrenal medulla hormone that usually increases heart rate and contractility. The parasympathetic division, sometimes called the housekeeper division, promotes all the internal responses we associate with a relaxed state; for example, it causes the pupil of the eye to contract, promotes digestion of food, and retards the heartbeat. The neurotransmitter utilized by the parasympathetic division is acetylcholine (ACh). 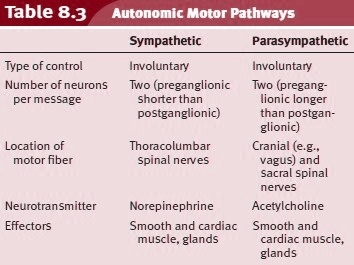 Table 8.3 contrasts the two divisions of the autonomic system. Figure 8.14 Autonomic system structure and function. Sympathetic preganglionic fibers (left) arise from the cervical, thoracic, and lumbar portions of the spinal cord; parasympathetic preganglionic fibers (right) arise from the cranial and sacral portions of the spinal cord. Each system innervates the same organs but has contrary effects.